Now until April 27th, 2019: big discounts on the following items: Biomat Aroma Stand, Pro size Biomat Black Canvas Travel case, Queen size Cotton Pad, Pro size Biomat Waterproof Cover, Rejuvena Premium, Alkalife 3000sl Water Filter. Buy One Alpha Max Serum 3.5 or Mega Bio Cleanse and Get One Free. Spring Sale: must pay shipping charge on all items. Buy One Get One Free Alpha Max Serum 3.5 or Mega Bio Cleanse only available to US customers, customer will be emailed a certificate for redemption of free item within 2 weeks of the order processing date. Contact us sales@bio-mat.com if you have any questions, and for International additional shipping fees. Lightweight and sturdy, position the Aroma stand within arms reach anywhere along your bed to free up nightstand space. Non slip pad with diffuser pads for Lavender oil included (each stand comes with 30ml bottle). Measurements: 13.38" x 13.38" x 32.48"
Black travel case with wheels and handle for ease to carry the Pro size Biomat. 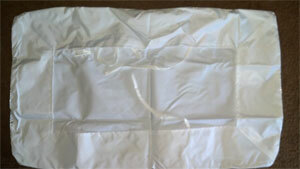 100% cotton pad cover for the Queen size Biomat. Machine washable. Dimensions: 56.69" x 80.31". Discontinued version. Pro 28.5" x 76". Discontinued version. Look younger by smoothing out and revitalizing your appearance with the Rejuvena Premium. Experience it in 3 steps - Gentle Soft Peeling and Ion Treatment with Red and Blue Light treatment. When our skin is unable to exfoliate naturally, it accumulates dirty old cells and its appearance becomes dull. Richway & Fuji Bio has scientifically developed the Rejuvena Premium and created it to respond to the real needs of aging skin. Let the Rejuvena Premium gently and naturally reveal your smooth lustrous skin. Mega Bio Cleanse 365 is your daily source of dietary fiber. Made with our proprietary blend of fibers and nutrients. Maintain your digestive health – all in a convenient package. Mega Bio Cleanse 365can only be shipped within the United States. Get a free 30 or 90 pack box of Mega Bio Cleanse 365 when you order the same.